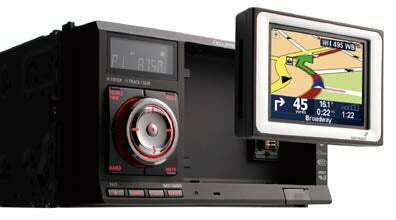 Fujitsu has teamed up with TomTom for its first joint foray into the US Sat-Nav market. The AVN2210p is a car audio unit complete with detachable PND that includes GPS antenna, rechargable battery and speaker, so that you can use it separately from the base unit. Maps of the US and Canada are on a separate SD memory card and It also benefits from TomTom Plus. The audio unit has a satellite broadcasting digital radio with optional tuner, plays MP3 and WMA files on its CD and CD-R/RW player, supports iPods and other DAPs. There's 5V of preamp outputs and a 50W x 4-channel power amp with three-band equalizer and a low-pass filter, and will support your cellphone via Bluetooth. Cost is around $900 and it will be available next month.